A SCARCE REVOLUTIONARY WAR AMERICAN-USED FRENCH MODEL 1766 (NAVAL-TYPE?) BRASS MOUNTED OFFICER’S FUSIL, ca. 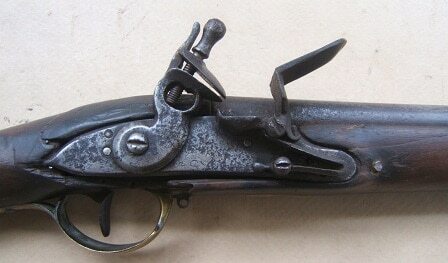 1770: In overall very good untouched, hard-used, original flintlock condition. The 40″, band-fastened, round, smoothbore, .72 caliber barrel with a top-mounted bayonet lug and untouched, russet toned steel surfaces with a fine touch-hole and generally smooth finish. The lock of standard Model 1763 configuration with matching lightly pitted/rust-stained, steel-gray surfaces, a faceted bridled powder-pan, a flat lockplate, its reinforced flat hammer, teardrop finial frizzen-spring and its frizzen with curled tail. The exterior with a faint Arsenal/Maker’s? mark, under the pan. In mechanically functional order with a strong mainspring and fine timing: the frizzen slightly loose from repeated use/wear. 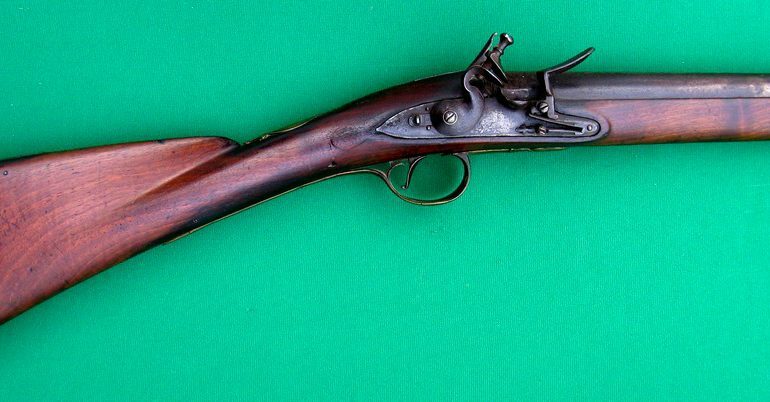 Walnut fullstock with Full BRASS Regulation Model 1766 French “Charleville” type mounts: three (3) barrel bands—-the rear band made without the “spring improvement of 1768”, the brass trigger-guard of regulation design with long pointed teardrop finials and a forward-mounted sling-swivel-stud. Flat “S”-shaped sideplate, an associated rear sidebolt and a screw-fastened buttplate with trefoil top finial of French Model 1733 Musketoon design (please see G. C. Neumann’s: “Battle Weapons…”, pg. 180). The mounts with various French-Arsenal?, inspectors’ marks. 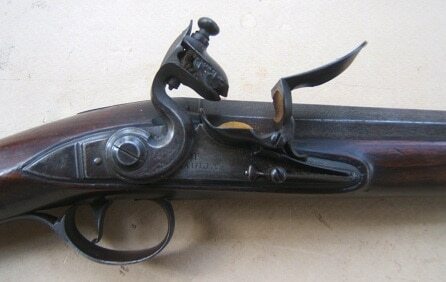 In overall very good, untouched, original flintlock condition. The barrel retains generally smooth, brown-gray surfaces with general signs of use and firing. The lock in functional order with matching, untouched, steel surfaces and illegible lockplate markings. Very good, regulation Model 1766, walnut fullstock with dark, richly oxidized surfaces, 85% finish and an American working-life reduced deeply fluted comb. 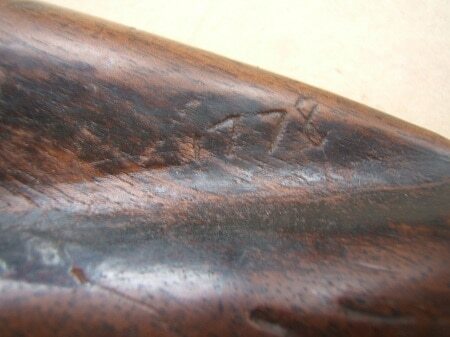 Also, inscribed (in classic 18th century characters) with ”R.M.” owner’s initials and with a crudely carved “1778” date, on the right side of the buttstock/comb. Retains approx. 65% finish with a working period American rose-head nail-repaired crack, at the sideplate mortise/trigger-guard. Retains untouched, richly toned and deeply patinated surfaces with scattered handling marks, minor gouges, abrasions, hairlines, signs of heavy use, wear and an old missing piece of wood, at the lock mortise’s bottom rear edge. Fine hardware with a smooth and mustard-toned age-patina and clear Arsenal inspector’s marks. A Very Good “American Used” Revolutionary War French Mdl. 1766 (Naval-Type?) Brass Mounted Officer’s Fusil, ca. 1770. Retains its original, button-head, iron ramrod and missing both of its sling swivels. Overall length, 55“. For similar examples, please see William Gilkerson’s: “Boarder’s Away” vol. 2 & G. C. Neumann’s: “Battle Weapons…” pg. 99 & 180 & for a nearly identical Musket, Please see, Hank Wieand Bowman’s: “Famous Guns From Famous Collections” (The Olin Mathieson (Winchester Arms, Corp.) Collection), pg. 32.